Who Is Doing All This Caregiving? There are 40 million unpaid caregivers in the U.S. Many caregivers, like me, are boomer women, often sandwiched between the needs of their parents and their own kids. A popular misconception is that caregivers are paid medical professionals, providing full-time care to someone in need of daily help, when in reality, most caregivers are family members or friends who are also working and managing their own families at the same time. For many, the caregiving role starts with simple things like scheduling a doctor’s visit or helping with daily errands, but gradually expands over time, until it becomes a major commitment in their lives. For our family, everything changed in June 2014 when my father-in-law was hospitalized for a subdural hematoma which occurred when he fell. Returning to living alone (even with the amount of support we had been providing with daily visits) was out of the question. Almost three in ten people who are caring for someone say their life has changed with caregiving, oftentimes for the negative. More than one in five say their weight, their exercise, or their social life has/have suffered. Emotionally, one in five say they are generally unhappier and one in three say they feel sad or depressed. That’s why AARP created a community where caregivers can connect with experts and other caregivers and can find information and tools to take even better care of the person who once took care of them. Candid disclosure: I participated in the National Family Caregivers campaign last year, promoted the benefits of the AARP Community, and wrote how I would be “digging in.” I have not dug in. One of the biggest challenges of this caregiver life, to me, is the fact that there are lots of great resources out there, but it takes time to track them down and research them. It feels like a catch-22. 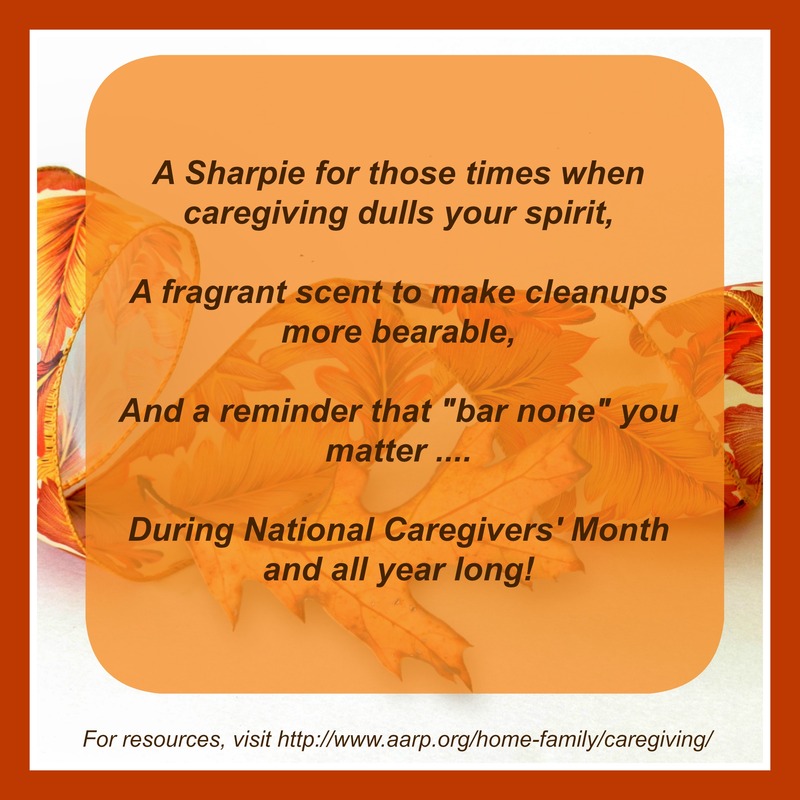 There is something that you can do during National Family Caregivers month to support a caregiver in your life. 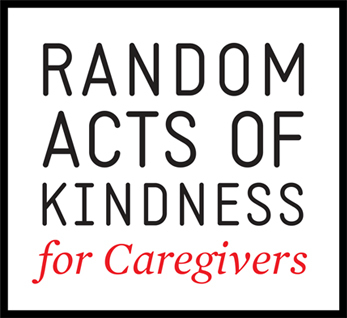 On behalf of the Ad Council and AARP I am asking for your support in helping to raise awareness of the Caregiver Assistance campaign through the Random Acts of Kindness for Caregivers initiative which aims to recognize and support unpaid caregivers in the U.S. The initiative, which is kicking off this month, encourages all Americans to perform an unexpected “Random Act of Kindness” for a caregiver. By starting a nationwide movement, we’ll raise awareness of caregiving and caregivers while at the same time reaching caregivers directly—helping to alleviate some of their daily stresses and reward them for their ongoing support. I’m going to share what I did, because if it brightens the recipients’ days even a quarter of how it brightened mine to do it, then brightness will abound!!! As I tried to decide what to do, several ideas floated through my mind. I thought about my fellow caregivers I passed going to and from treatment at the Tallahassee Memorial Cancer Center, about how I could possibly sit in the parking lot, wait until they had taken their patient in, then sneak a note and small gift onto their car. But, being a caregiver myself, I have to be a little strategic about when I can leave the house and I wasn’t sure how much time all that stalking would take (I’m also really bad at being sneaky!). 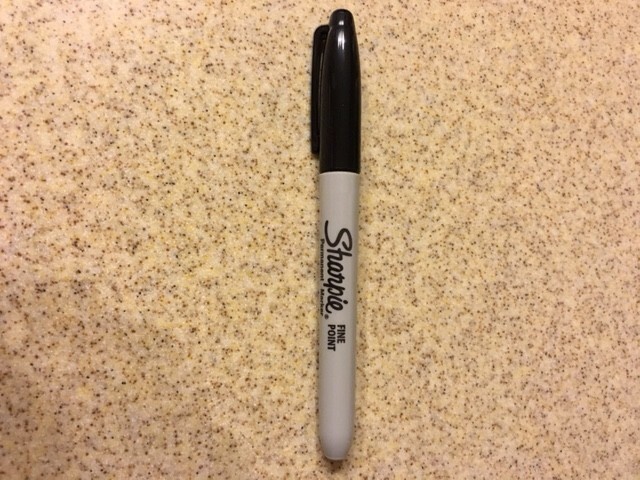 A Sharpie because a) I love Sharpies and b) a Sharpie was a great fit for the verse I had planned. (It turns out the caregivers at Elder Day Stay have to mark the participants’ belongings with Sharpie so this was a win-win for all!). 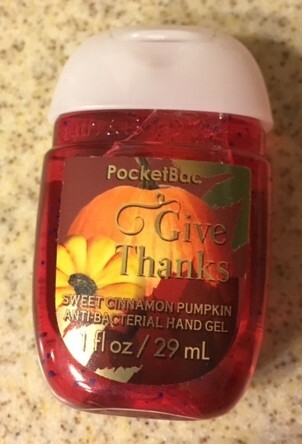 A fragrant hand sanitizer because one of the universal truths of caregiving appears to be: bodily functions will always be involved. 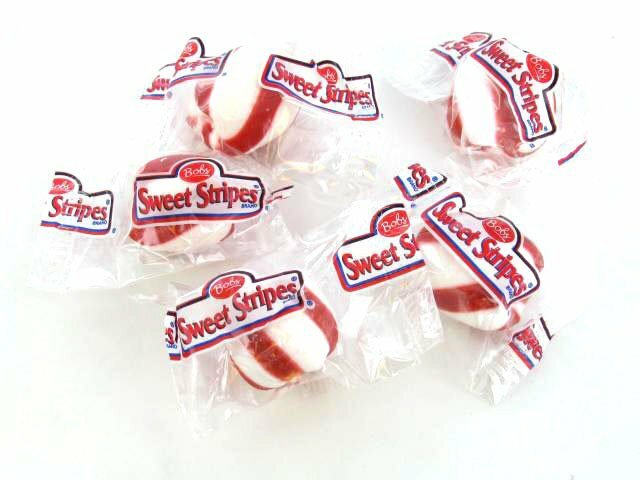 I want them to at least have a sweet smell to mitigate the less fragrant aromas. I love the “give thanks” sentiment! 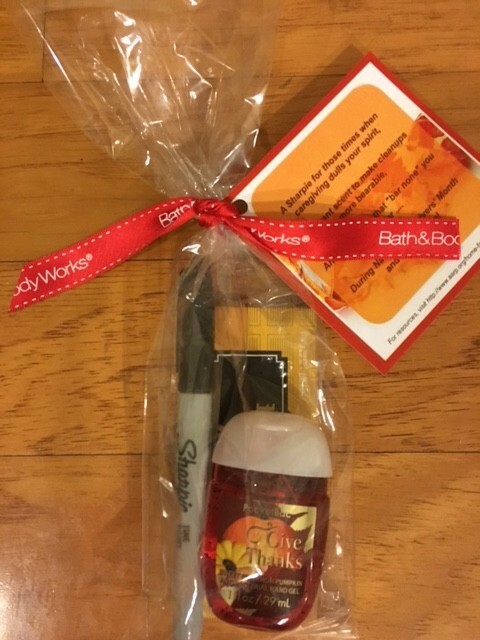 Once Cam and Shanelle at the Governor’s Square Bath and Body Works learned what I was doing, they gave me 30 bags and 30 pre-cut ribbons to use for these treats, as well as fantastic attitudes! I am grateful. A chocolate bar because a) these caregivers deserve a treat and b) I needed a bar of some kind to fit in with the verse I had planned. 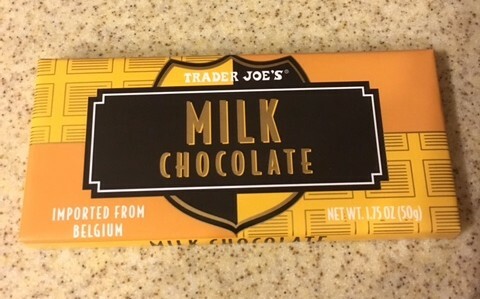 I thought about getting something healthy (protein bar, fiber, blah blah blah) however I wanted these people to have a small but decadent treat! Whose Day Can YOU Make? Is there someone in your life or community who is serving as a caregiver that you can do something nice for? It doesn’t have to be complicated or expensive, just a small gesture that makes a caregiver’s life a little easier. After you choose (and do!) your random act of kindness for a caregiver, please share your story with AARP. If you submit a 150 word or less summary of how you made a caregiver feel special along with a photo, you’ll be entered to win a cash prize from a $10,000 pot. 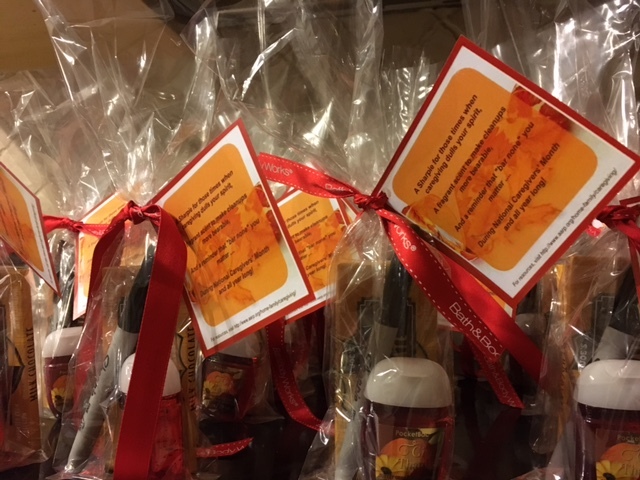 (Note: the contest lasts through March 15, 2016, but Thanksgiving would be the perfect time to get the random act of kindness ball rolling!). You could make the tiny bit of “me time” difference those Cancer Center mints provided me! This is a sponsored post on behalf of Element Associates and Midlife Boulevard.